Part of the fun of these "Retro Reviews" of older single comics in my collection is that I have the opportunity to learn a little something about the history of comics in the process. I came to the collecting part of comics a bit late in the game. . .the reading part started in the 70's but the carefully storing them in bags, boards, and boxes didn't come until the late 90's. . .so it's interesting to educate myself a bit on my favorite hobby. So what did I learn from taking this comic book down off my office wall and breaking it out of the frame it's been sitting in since I bought it for the great cover about 5 years ago? Well. . .I learned a bit about Jack "King" Kirby and WHY he was back. I'm gonna confess that I really don't know that much about Kirby beyond the basic knowledge that he was regarded as a talented artist and a groundbreaking man of ideas who was instrumental in creating and co-creating many of the most popular comic characters in existence, and that his influence still resonates through the creators of the comic world today. He was also a bit under-appreciated and stood in the shadow of his Marvel co-creator Stan Lee. From what I understand, Stan was "The Man". The Showman, the promoter, the public voice and face of Marvel comics while Kirby was the man behind the curtain, quietly plugging along and really not getting much credit for his hard work. Eventually it came to the point that he left Marvel for their "Distinguished Competition", DC Comics. From what I understand, he was lured in with the promise of being given credit for his creations. Unfortunately, things didn't exactly work out for him at DC. Yeah, he was given credit for his new creations (known collectively as The Fourth World), but he didn't own them so DC could still do whatever they wanted with them. Worse, his new creations didn't sell as well as DC was hoping, so Kirby was pretty much forced to work on characters and books that he really didn't want to. . .leading to him becoming someone quietly plugging along and not getting much credit for his hard work, just for a different company. In other words, he learned within 5 years that the grass wasn't greener on the other side of the fence. And so he returned to what he was more familiar with, Marvel Comics and the character he had created with Joe Simon way back in 1940. . .Captain America. The issue at hand (as proudly stated on the cover) was "King" Kirby's return to the Marvel fold as artist, writer, and editor of the series. So that's a pretty basic sketch of the background of this comic. There's a lot to learn about Jack Kirby, and his contributions to the history of comics cannot be denied. But Longbox Junk isn't a hero worship thing, and so now that history is out of the way, the question becomes: Is this comic any good? Let's find out! COVER: Jack Kirby & John Romita Sr.
First off. . .that cover! There's no denying that's a great cover right there. I have a rotating collection of comic covers on my office wall at work. This is the only one that's been there for the whole 5 years. The covers are always a good conversation starter, but this is one that REALLY catches people's eye. The primary colors, that "In Your FACE!" Captain America, that Red, White, and Blue title, the hyperbolic text. It all combines to draw attention like no other cover I've had up on that wall. Some people find it a bit politically incorrect in a "AMERICA, HELL YEAH!" kind of way, but I'm an "AMERICA, HELL YEAH!" kind of guy. Now THAT'S out of the way, let's see what Kirby as writer, artist, and editor of this book put under that eye-catching cover. 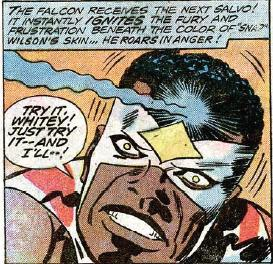 . .
At Leila (Falcon's girlfriend) Taylor's apartment, Captain America and Falcon are engaged in some good-natured arm wrestling and are suddenly overcome with hate for each other. They start fighting but come to their senses after trashing Leila's kitchen. Leila pulls a knife and goes after the heroes. . .justified, from the way they were just brawling in her house, but there's more to it than that. She's being affected by the same thing. While Falcon restrains Leila in a most manly manner, Cap goes outside into a raging mob, complete with gunfire, overturned cars, and 70's jive talk. Because they aren't Nazis or Hydra, he doesn't lay waste to the crowd of civilians and finds himself overwhelmed until the mob moves on. As he recovers from being trampled, Cap finds a small device wedged between buildings. The closer he gets to it, the more he finds himself losing control of his mind, but he's CAPTAIN FRIGGIN' AMERICA, and he manages to fight through the madness and destroy the device with his shield, ending the riot. Falcon starts rescuing citizens while Cap recovers from the effects of the device. The whole area is in shambles. 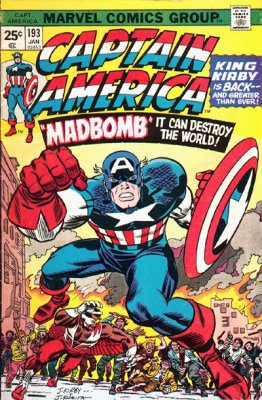 Soon after, a SHIELD agent who looks and acts more like DC's Phantom Stranger than Nick Fury joins Cap and Falcon and tells them the device that caused the trouble is a "madbomb." A short plane flight later, Cap and Falcon end up with Phantom Stranger. . .er. . .the mysterious SHIELD agent at "Madbomb Control," a secret government base, where they find themselves suddenly running through a lethal obstacle course including poison gas, flying projectiles, crushing walls, pits and random dudes to punch. They fight their way through to discover that they were just put through a test to confirm that they are indeed the real Captain America and Falcon in an overly-elaborate security setup the memory of which SHOULD have had Cap wanting to vote FOR hero registration in Civil War just so he could have an official Captain America picture ID to avoid that kind of crap. . .BUT I DIGRESS! After making their way through the worst security checkpoint ever, Cap and Falcon meet with (then) Secretary of State Henry Kissinger in an unexpected cameo where he tells the pair of heroes (now that their identity has been firmly established) to go ahead and call him "Henny" and proceeds to brief them in a hilariously-written German accent that probably had Cap restraining himself from automatically going into Nazi-Punching mode. Kissinger tells them of two smaller madbombs, dubbed "Peanut" and "Dumpling" that devastated the towns of Miner's Junction and River City. Then he shows them a photo smuggled out by a SHIELD agent, killed in the process, revealing "Big Daddy," a madbomb big enough to destroy the United States which the government thinks is timed to go off for the Bicentennial. Cap is like, "OH HELL NO!" and the issue ends. Like I said above, Longbox Junk is NOT a hero worship blog, so if you are the kind of comic fan that thinks Jack Kirby can do no wrong, you MIGHT just want to stop reading here because you're about to get some honesty based on THIS issue alone. Okay. . .everyone staying that's staying? For being written in 1975, this comic reads like a Silver Age throwback. . .and I don't mean that in a good, nostalgic way. The plot is extremely simple and mundane at best. At worst, it's derivative and unimaginative for coming from a creator lauded for his big ideas. This issue reads more like filler than the grand second coming of "The King". The dialogue is incredibly stiff and full of exposition. One would expect that such a highly-regarded artist would employ a bit more of the old "show, don't tell" instead of filling panels with caption boxes explaining exactly what's going on. The story is fairly empty of characters, and aside from Cap and The Falcon, there aren't any developed characters at all. Leila Taylor exists only to play the part of knife-wielding crazy woman who has to be manhandled into submission, the mysterious SHIELD agent exists only as a travel device. Henry Kissinger exists as an expository info dump. There's a couple of other examples to be found as well. It MIGHT just be the fact that this comic is a relic of the 70's. On the other hand, if it's the product of a white dude in his late 50's trying to be socially relevant, it's pretty heavy handed and sad. That's not to say this comic is ALL bad. It's not. Kirby is known more for his art than his writing, and in this issue, I can see why. The splash page of Falcon and Cap is fantastic! I've already talked about the awesome cover. Throughout the issue the art is extremely solid. His characters are a little bug-eyed, but other than that, the story visually flows well and the action scenes are dynamic and exciting. The art in this comic from the 70's is better than some of the art being done today. This comic seems to me the perfect example of why comic creators shouldn't edit their own work. The fact that Kirby was plotter, scripter, penciler, and editor on this book was definitely a mistake; there was no one to counterbalance him and prevent him from going off in a bad direction, and it definitely shows. While the art throughout the issue was very solid, the writing could have used another set of eyes on it. I'm not trying to bash Kirby in any general sense here. . .to be honest, I really haven't read much of his other work as a writer. . .but based on THIS issue alone, I have to say that sometimes people need to find a lane and stay in it. Kirby was a good artist and behind the scenes idea man. He should have stuck with that instead of trying to add writer to his resume. Back to Longbox Junk business as usual. Be there or be square! Captain Marvel #50 Fn 6.0 With The Avengers Vs. The Super-adaptoid!